This quote from the Chicago Tribune is interesting, in the sense that it is incomplete. 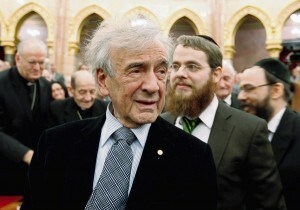 Actually, Wiesel had already written his book a year earlier and given it to a publisher in Argentina – according to his memoir “All Rivers Run to the Sea.” Yet Wiesel ignores that part of his story when speaking to the news media, just as he didn’t tell Mauriac about it and let Mauriac believe that his condensation of his original story was the first (original) writing of it. “First of all, the Chicago Tribune is one of the greatest papers in the world,” said Wiesel, 83, from his New York office. Correction, Elie. The Chicago Tribune used to be one of the greatest papers in the world [back when you were a “journalist” for an Israeli paper] but since it was bought out by Sam Zell in 2007 it’s just another Jewish/Zionist mouthpiece that gives literary awards to the likes of you.